Dexter has invented a device for cloning chicken. Everything is perfect, but now he has to catch all those chickens. 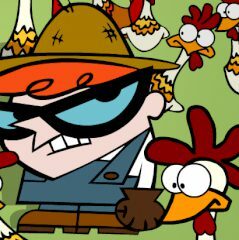 Help Dexter to catch all the chickens and gain extra points. Be careful, it is not desirable to kill chickens. In that case you will lose your points.